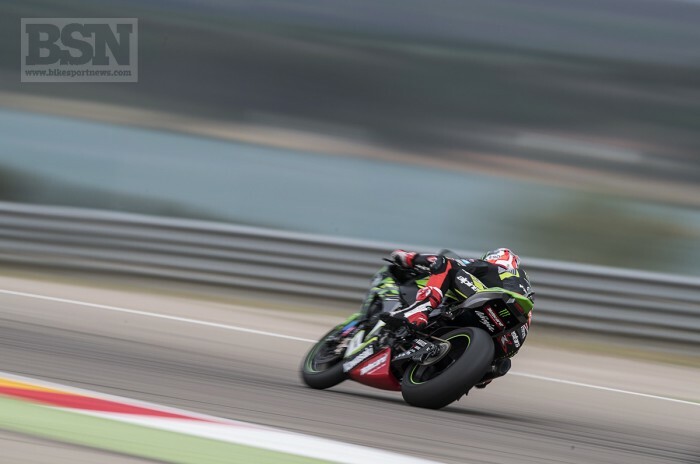 WorldSBK championship leader Jonathan Rea scored his second race win of the 2018 season after battling for most of the restarted 17-lap race inside the leading pack. Rea had a huge moment on the brakes into turn one which saw the rear of his ZX-10RR snap sideways but he kept the lead before surrendering it to a charging Xavi Fores. The Castletown resident hit back a few laps later and then eased away from a three-rider Ducati battle with five laps remaining to win by 1.450 seconds. Aruba Ducati’s Chaz Davies made an audacious pass on Fores (Barni Racing Team Ducati) in the final chicane on the last lap to take second place, with Fores just 0.023 seconds behind as they scrapped it out in front of the start-finish grandstand. Podium contender Marco Melandri (Aruba.it Racing – Ducati) suddenly dropped back with just two laps to go, finishing fourth. Michael van der Mark (Pata Yamaha Official WorldSBK) was fifth, the slowing Tom Sykes (Kawasaki Racing Team) sixth and Alex Lowes (Pata Yamaha Official WorldSBK) seventh. Lowes had a good go at taking his first ever race win in the early stages but dropped back as Rea, Melandri and Fores made their eventual escape - to be joined by Davies as the race rolled on. First timer Michael Ruben Rinaldi (Aruba Racing IT Ducati Junior Team) was eighth, finally on his own after running in the back of the leading group. A titanic battle for midfield points saw Toprak Razgatlioglu (Kawasaki Puccetti Racing) ninth, Román Ramos (Team GoEleven Kawasaki) tenth, Superpole faller Loris Baz (GULF ALTHEA BMW Racing Team) 11th, Jake Gagne (Red Bull Honda World Superbike Team) 12th and Davide Giugliano (Milwaukee Aprilia) 13th. PJ Jacobsen (TripleM Honda World Superbike Team) was 16th, just missing put on a points score. The first attempted running of the race was halted by a red flag as Leon Camier (Red Bull Honda World Superbike Team), Lorenzo Savadori (Milwaukee Aprilia) and Jordi Torres (MV Agusta Reparto Corse) clashed, after Camier had fallen. Camier was taken to hospital for deeper medical checks, but was described as conscious and stable at the end of the race. More updates when they become available.